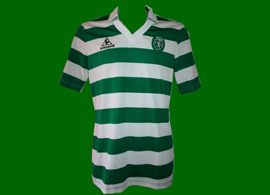 This was the last year that Le Coq Sportif made the Sporting jersey. 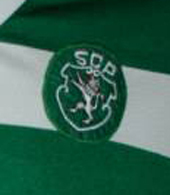 So ended one of the best pages of the history of the Sporting Lisbon kit. 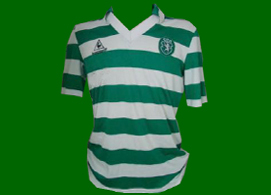 Later on other companies also made excellent jerseys, for instance with Adidas in the 1990s, or in the Sporting Lisbon Centennial year, and even the classic Sporting 2011 2012 jersey, but Le Coq Sportif conquered a special place in the history of the Sporting Lisbon soccer jersey. 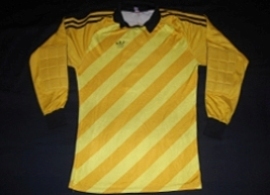 Green away jerseys with the pointy collar weere worn in at least one game. 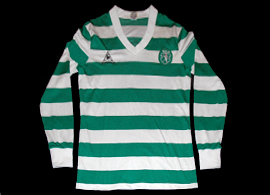 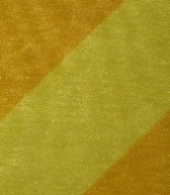 Split green/white "Stromp" jerseys were also worn, of the design used since 1984/85.